This 131-kilometer square wildlife sanctuary is created to protect the Indian Giant Squirrel. Bhimashankar wildlife sanctuary is basically a part of Sahyadri ranges also known as western Ghats. The western Ghats which is listed in 12 best biodiversity part if the world. A spotless environment of nature with hills, greenery, waterfalls, wildlife and forests, this is all about this sanctuary. This place is also known for the temple, which makes it a leading place for spirituality. This wildlife sanctuary of Maharashtra is established in 1984 in Pune, thane and Raighad district. The main attraction of this sanctuary Leopard, Hyena, spotted eagle and Hornbill etc. 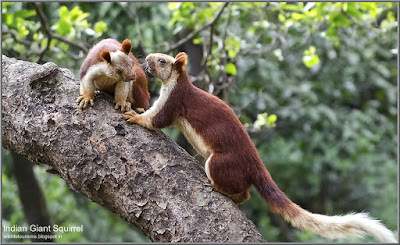 Basically a home of Indian squirrel (also a state animal of Maharashtra) Bhimashankar sanctuary is also a habitat for green pigeon black eagle and Malabar Whistling Thrush. Nice place for the trekkers I have visited this sanctuary last year. If you are a nature lover then I will suggest you go there in Monsoon Season. Bhimashankar Temple is just a walking distance from here. So you have the opportunity to visit one of 14 jyotirlingas of Lord Shiva. Best place for holiday and family outing. If you want fresh air and beautiful scenery than there is no better place than this. I have visited after taking information about mayani bird sanctuary near vaduj, Maharastra last year to see birds and I have found this wildlife sanctuary richer in terms of Indian birds. This wildlife sanctuary is located in 6 hours from the Mumbai, the best time to see the wildlife of this place is October to may, this time many migratory birds also visit here. Every year many tourists visit here to feel the adventure of trekking. Bhimashankar wildlife sanctuary offers many opportunities for the adults and kids to learn about nature.